One Easter Egg many fans were looking for in Solo: A Star Wars Story was an appearance by Tag and Bink, a pair of side characters who first appeared in the comic book Tag and Bink Are Dead (a parody series that is to Star Wars what Rosencrantz and Guildenstern Are Dead is to Hamlet). The duo start the story as members of the Rebel Alliance aboard the Tantive IV, and through a series of hilarious coincidences wind up appearing in the background of several famous Star Wars scenes, always with a mask on. 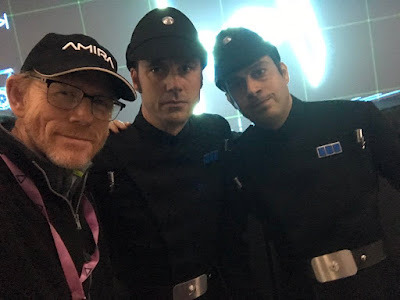 In October of last year, director Ron Howard shared a picture of Solo co-writer Jon Kasdan and first assistant director Toby Hefferman dressed as Imperial officers with the caption "Tag and Bink?" Kasdan would quickly confirm that the characters were in the film and that he had been a fan of the original comic book. Unfortunately, although in true Tag and Bink form, their story wound up on the cutting room floor. Kasdan confirmed in an interview with ComicBook.com that the characters would have featured in a scene that was deleted, where Han is being kicked out of the Imperial flight academy (for having a mind of his own). "And as he's getting kicked out, he's being sort of moved out of the official courtroom by Tag and Bink, played by [me] and Toby Hefferman, our [first] AD. And we were certain that these scene was going to remain because it's a crucial moment in his life. And it was the last thing to come out. It was heartbreaking." He also added that he believed fans would get the chance to see the scene in the deleted scenes on the film's home media release.